We all like to cook (and of course – eat) homemade food prepared with fresh herbs. It just tastes much better that way, don’t you agree? But, when we put our herbs in the refrigerator, they don’t really last so long. Well, there is a solution. For less then 16 dollars, you can buy a Fresh Herb Keeper. 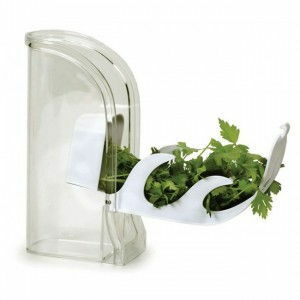 With this cool kitchen gadget you can extend the freshness of your herbs up to three times longer. It’s especially great for perishable leafy herbs such as basil, chives, cilantro, parsley and mint. And it’s really easy to use – simply swing the tray out, pick of the amount of herbs you need and then swing the tray back to automatically submerge stems and roots in water for maximum freshness. With this device you can enjoy ‘just picked from the garden’ flavor whenever you want. Its stylish design will definitely look good in your refrigerator!